Illuminated Manuscript, Bible (part), Creation of the world, and Eve, Walters Manuscript W.805, fol. 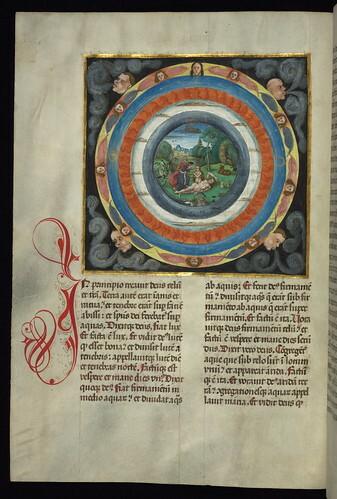 6v, originally uploaded by Walters Art Museum Illuminated Manuscripts. This large-scale manuscript contains the first eight Old Testament books, Genesis through Ruth. The date of completion is given, February 2, 1507. The illumination of the Creation within a cosmographic scheme is based in part on the woodcut illustrations of Creation in the 1483 Koberger Bible, and the 1493 Nuremberg Chronicle by the same printer. Large historiated initials mark the beginning of each book. This large format form of the bible was revived in the low countries and Rhineland in the mid fifteenth century, and later in the century they were being made in south east Germany and Bohemia. The style of the miniatures in this manuscript is typical of upper Austrian miniature painting of the later fifteenth century. This is one of the historical illustrations that would be great to see in a laser woodcut complete with paint and frames.